There are plenty of security schemes and strategies you can implement if you're a Shared Web Hosting company sysadmin however probably the most vital one is to install on Apache + PHP Webserver SuPHP module. Description: Common files for mod suphp Suphp consists of an Apache module (mod_suphp for either Apache 1.3.x or Apache 2.x) and a setuid root binary (suphp) that is called by the Apache module to change the uid of the process executing the PHP interpreter to the owner of the php script. 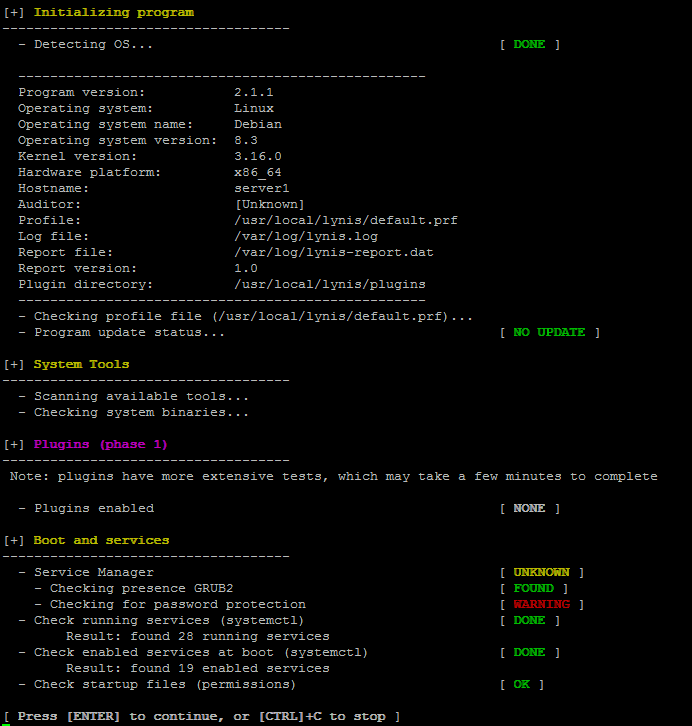 So what SuPHP actuall does is to run separate CPanel / Kloxo etc. 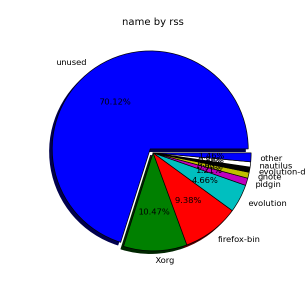 Users with separate username and groupid permissions coinciding with the user present in /etc/passwd , /etc/shadow files existing users, thus in case if someone hacks some of the many customer sites he would be able to only write files and directories under the user with which the security breach occured. 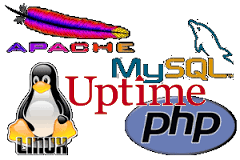 On servers where SuPHP is not installed, all systemusers are using the same UserID / GuID to run PHP executable scripts under separate domains Virtualhost which are coinciding with Apache (on Debian / Ubuntu uid, gid – www-data) or on (CentOS / RHEL / Fedora etc. – user apache) so once one site is defaced exploited by a worm all or most server websites might end up infected with a Web Virus / Worm which will be trying to exploit even more sites of a type running silently in the background. This is very common scenarios as currently there are donezs of PHP / CSS / Javasripts / XSS vulnerability exploited on VPS and Shared hosting servers due to failure of a customer to update his own CMS scripts / Website (Joomla, Wordpress, Drupal etc.) 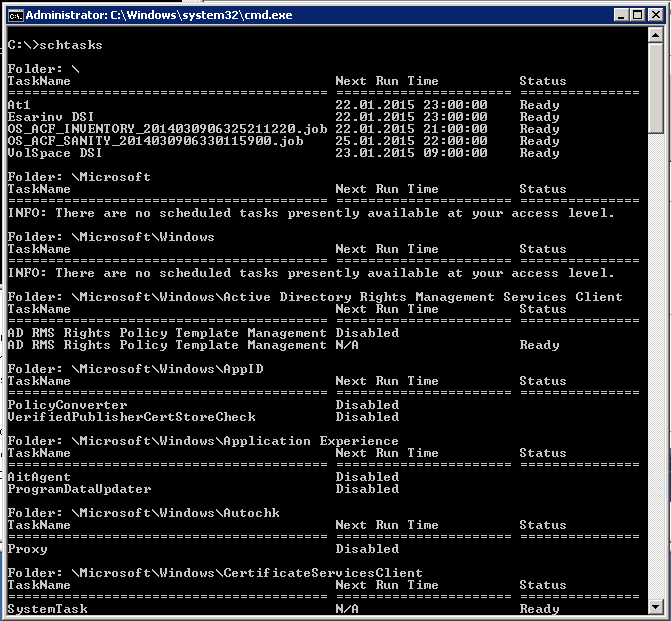 and the lack of resource to regularly monitor all customer activities / websites. Therefore installing SuPHP Apache module is essential one to install on new serverslarge hosting providers as it saves the admin a lot of headache from spreading malware across all hosted servers sites .. 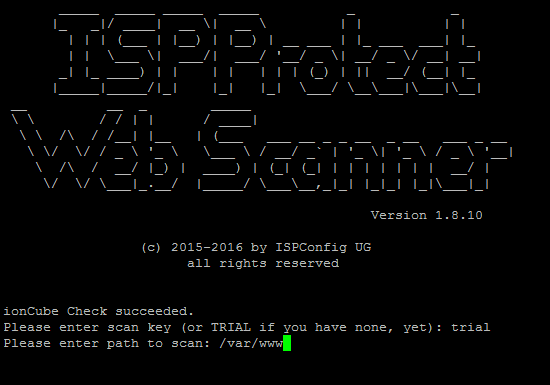 Some VPS admins that are security freaks tend to also install SuPHP module together with many chrooted Apache / LiteSpeed / Nginx webservers each of which running in a separate Jailed environment. Of course using SuPHP besides giving a improved security layer to the webserver has its downsides such as increased load for the server and making Apache PHP scripts being interpretted a little bit slower than with plain Apache + PHP but performance difference while running a site on top of SuPHP is often not so drastic so you can live it up .. 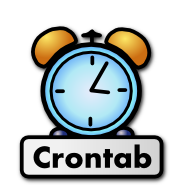 However if you need to be involved in scripting and setting as a cron job tasks to be performed in case if high memroy consumption by a service you will need to use few lines of code. 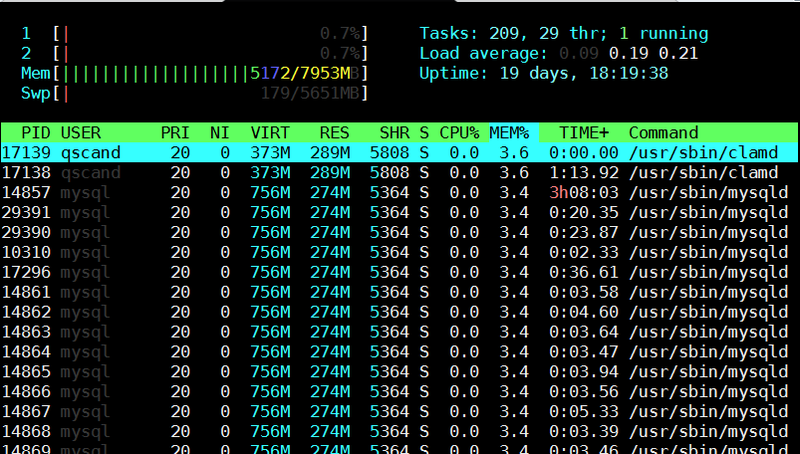 Below are few examples on how Linux user memory usage can be shown with ps cmd. Below is output from machine where this blog is running, the system runs ( Apache + PHP + MySQL Webserver + Qmail Mail server and Tor) on Debian GNU / Linux. Also a raw script which can be easily extended to give you some custom information on memory use by user list_memory_use_by_user.sh is here. 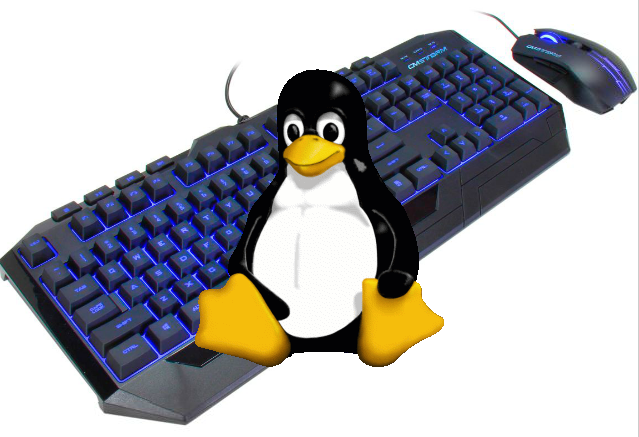 Getting more thoroughful and easier to read reporting without beeing a 31337 bash coder you can install and use on Linux smem – memory reporting tool . 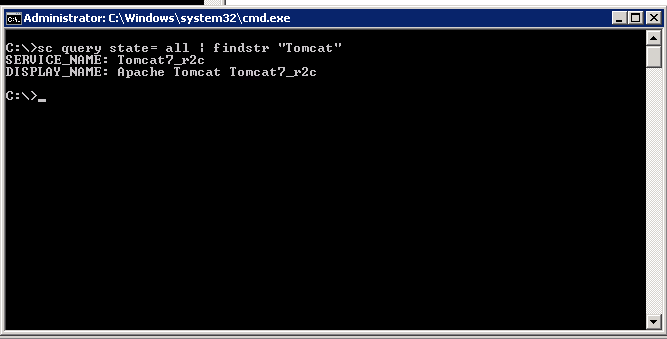 root@desktop-pc:~# smem –bar pid -c "pss uss"
If there is a high percentage shown in firmware/hardware this means some buggy module is loaded in kernel eating up memory, to fix it debug further and remove the problematic module. userspace memory actually shows the percantage of memory out of all server available RAM that is being consumed by applications (non kernel and other system processes which make the system move). 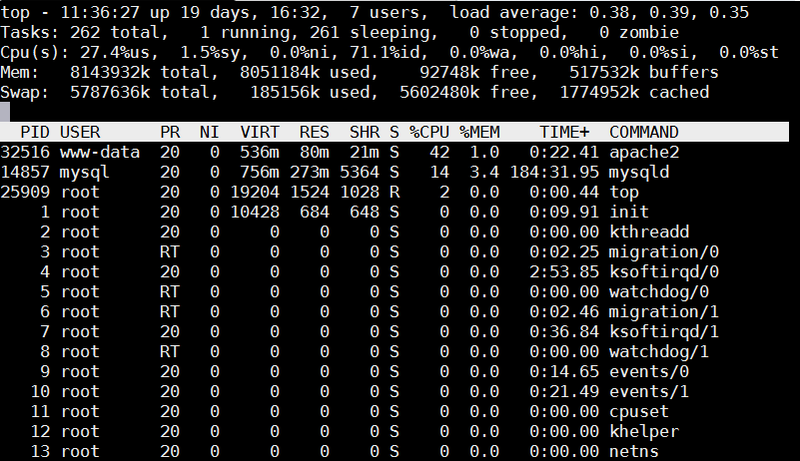 You see in above example the kernel itself is consuming about 40% of system overall available memory. We all know the SWAP field stands for hard disk drive used as a memory when system is out, but there are 3 fields which smem will report which will be probably unclear for most here is also explanation on what USS / PSS / RSS means? RSS is the Resident Set Size and is used to show how much memory is allocated to that process and is in RAM. It does not include memory that is swapped out. It does include memory from shared libraries as long as the pages from those libraries are actually in memory. It does include all stack and heap memory too. There is also PSS (proportional set size). This is a newer measure which tracks the shared memory as a proportion used by the current process. 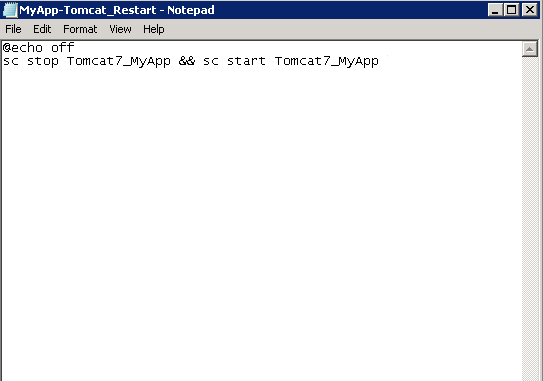 So if there were two processes using the same shared library from before. PSS = Proportional set size, (PSS), is a more meaningful representation of the amount of memory used by libraries and applications in a virtual memory system. Because large portions of physical memory are typically shared among multiple applications, the standard measure of memory usage known as resident set size (RSS) will significantly overestimate memory usage. 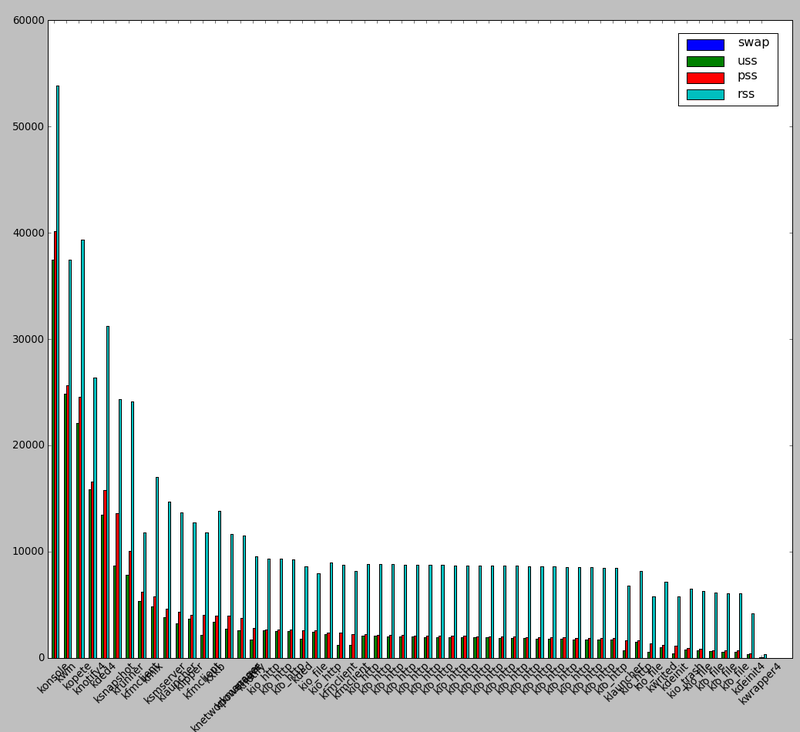 The parameter PSS instead measures each application’s “fair share” of each shared area to give a realistic measure. 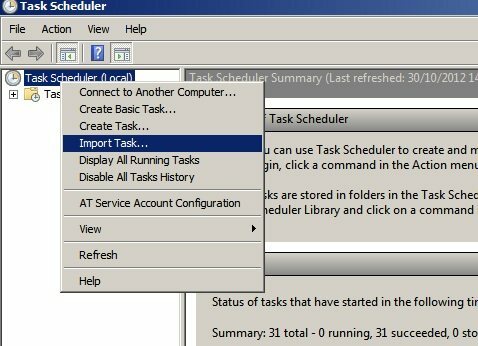 For most admins checking out the output from RSS (output) should be enough, it will indicate which user and therefore which daemon is eating up all your memory and will help you to catch problematic services which are cause your server to run out of RAM and start swapping to disk. First thing that came to my mind was to loop over it with for loop and grep out only /directory/ and files returning permissioned denied. 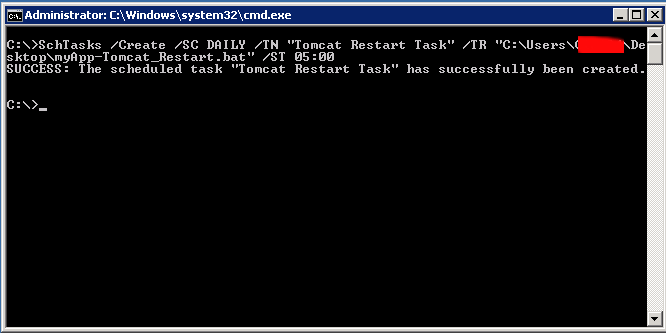 This works but if chmod has to be done to few million of files, this could be a real resource / cpu eater. 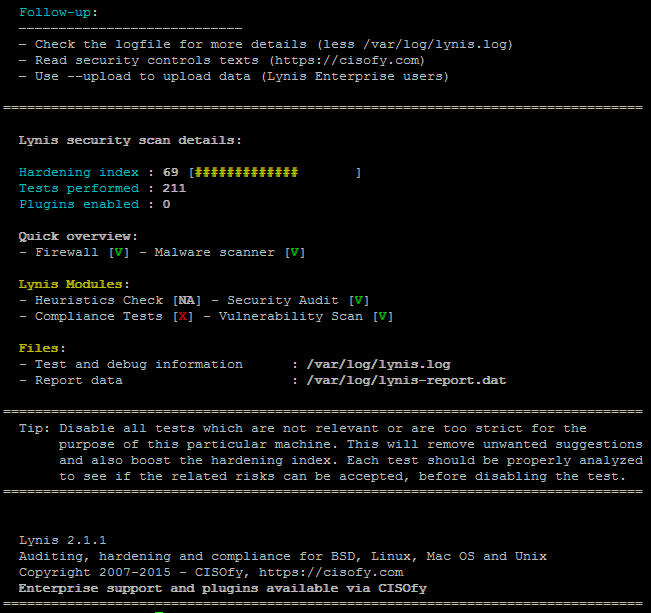 The better way to do it is by only using Linux find command native syntax to omit files. Above find will print all files in . 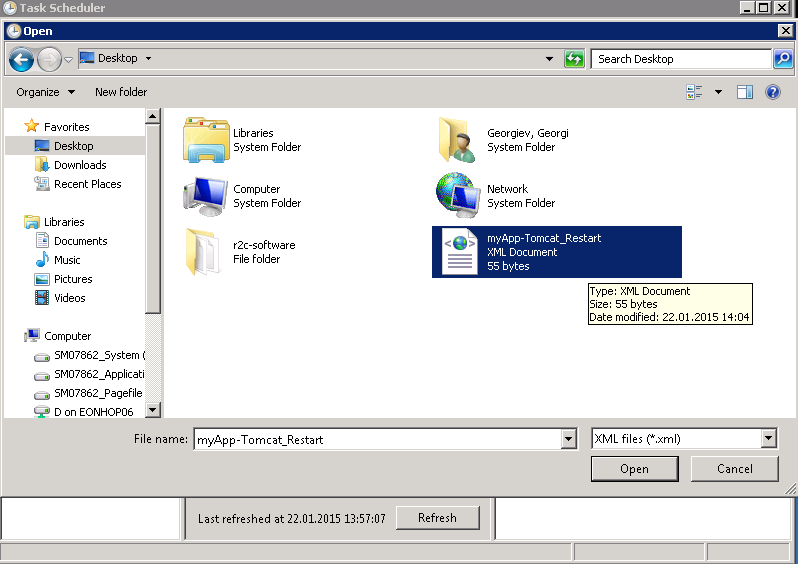 – current directory from where find is started, except files: onenote and file. Another thing he wanted to do is ignore printing of hidden . (dot) files like .bashrc, .profile and .bash_history while searching for files – there are plenty of annoying . * files. prune – prunes all the directories other than the current directory. that has to be deleted, however there was nowhere mentioned under what kind of credentials (with what kind of user) are the cron scripts running? Hence I had to look up all users that has cronjobs and find inside each user's cronjobs whether respective script is set to run. Herein I will explain shortly how I did that. drwxr-xr-x 2 root root 80 2014-05-22 11:15 .
drwx—— 4 root root 120 2008-02-25 15:45 ..
drwx—— 2 root root 72 2014-04-03 03:43 . /var/spool/cron – is crond (/usr/bin/cron/)'s spool directory. drwx------ 2 root root 72 2014-04-03 03:43 .
drwx------ 4 root root 120 2008-02-25 15:45 .. 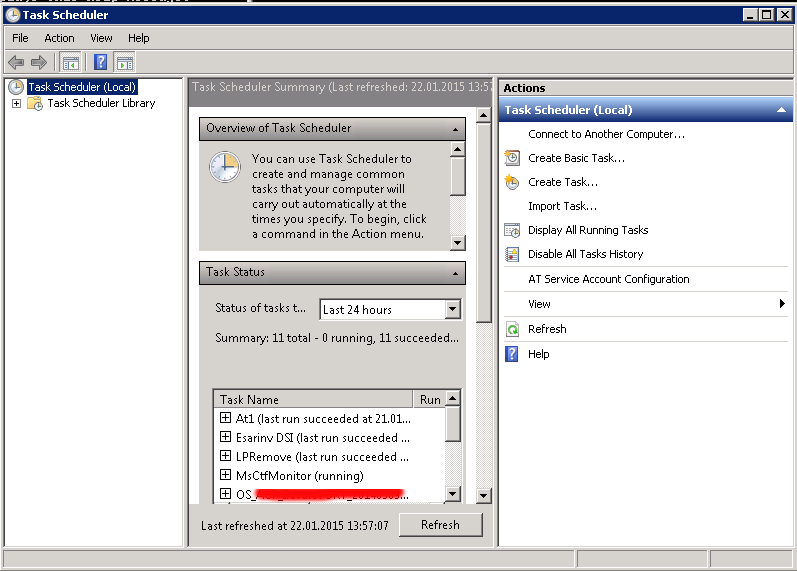 Above output shows only root superuser has defined crons. Besides toilet and figlet another cool entertainment proggie is cowsay. 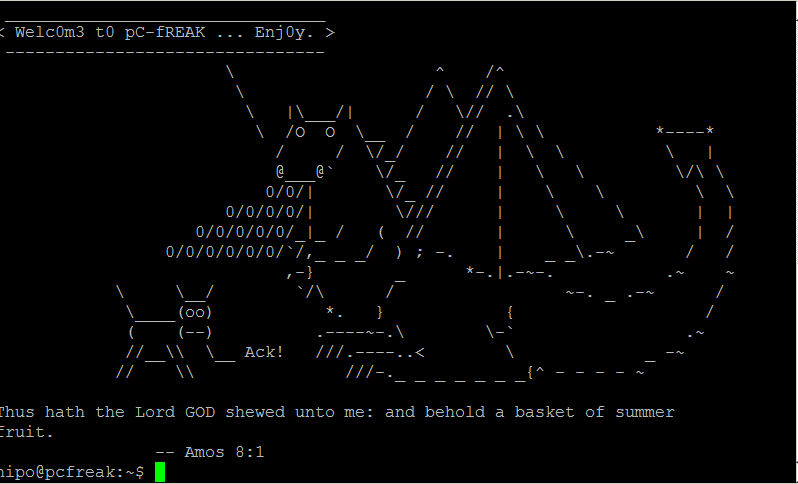 On my home Linux router I use cowsay together with a tiny shell script to generate me a random Cow Ascii Art fun picture each time I login to my Linux. cowrand is set to run for my user through ~/.bashrc. 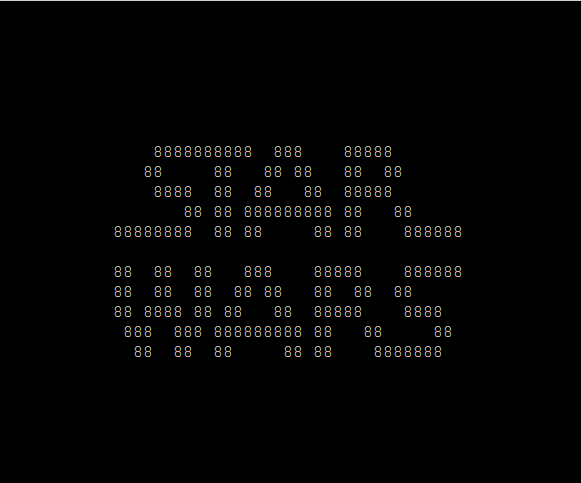 In the spirit of ascii art fun arts today I've stumbled on another cool and uselesss few kilobytes program called "SL". SL is very simple all it does is it cheers up you by displaying a an animated train going through the screen once you type by mistake "sl" instead of ls (list command). SL 's name is a playful joke itself as well it stands for Steam Locomotive. 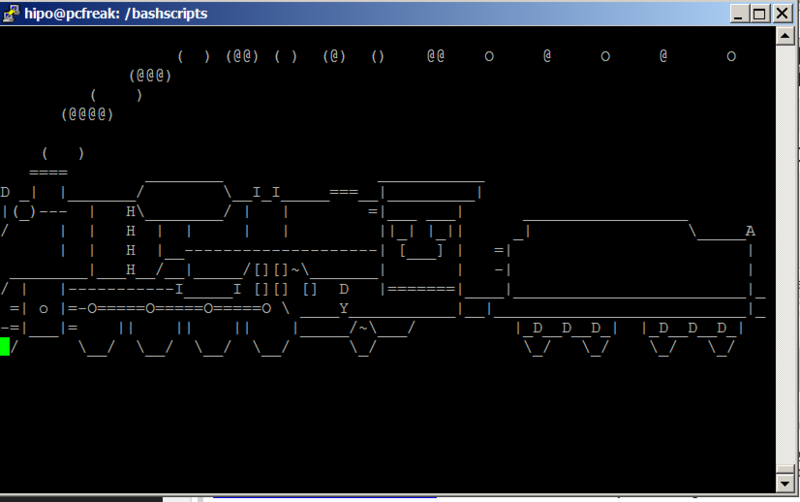 If you know other cool ASCII art animation scripts / ASCII art games or anything related to ASCII art for Linux / Windows, please drop me a comment.